The concealed roof panel roll forming machine, an updated generation of traditional roll forming machine, have successfully solved the problem of leakage. 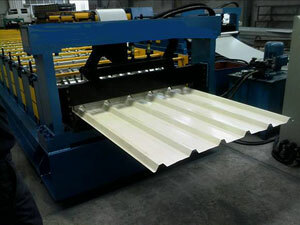 Commonly, this kind of concealed roof panel roll forming equipment is used to roll forming colored galvanized steel sheets with the size of 1000mm × (0.4~0.8)mm × Lmm. The line is made up of uncoiler and its base, coil sheet guiding equipment, roll forming system, post-cutting equipment, and computer control cabinet. 1. This production line can produce strong and durable corrugated panels with high wave crest. 2. The joining type of these panels has the feature of self-locked and excellent waterproof property, making this production line easy and safe to install. The roof panel roll forming machine commonly is applies to produce the roof of factory, warehouse, garage, and gymnasium etc. Yingkou Changsheng Steel Structure Project Co.Ltd is a professional manufacturer and supplier of roof panel roll forming machine in China. Apart from roof panel roll forming machine like corrugated sheet roll forming machine 840, deck floor roll forming machine, etc. we also offer auxiliary equipment products like automatic tube bending machine, plate bending machine, etc; high pressure polyurethane insulation painting machine including low pressure polyurethane foam machine and high pressure polyurethane foam machine; k-span machine, like automatic building machine, ultimate building machine and arch style buildings forming machine. With good quality and affordable price, the products produced by our company has exported Germany, Holland, India, Indonesia, New Zealand, Syria, United Arab Emirates, Russia, Kuwait, South Africa, and Bangladesh. If you are interested in our products, please contact us for details.